The Tombs of the Nobles actually comprises a number of distinct areas on the West Bank at modern Luxor (Ancient Thebes). These areas mostly lie in five different regions. Farthermost north is an area known as el-Tarif, where large, row tombs were dug during the late Second Intermediate Period and early Middle Kingdom. Just south of el-Tarif is Dra Abu el-Naga, which is a hillside with about 80 numbered tombs most belonging to priests and officials of the 17th through 20th dynasty, including some rulers of the 17th dynasty. Just southwest of Dra Abu el-Naga is an area called El-Assasif, where there are 40 tombs, mostly from the New Kingdom and later. Just south of El-Assasif is El-Khokha, a hill with five Old Kingdom tombs and 53 numbered tombs from the 18th and 19th dynasty. The vizier under Tuthmosis III and Amenhotep II was responsible for taxation, justice and foreign policy. The reliefs in his tomb depicts tribute being brought to Egypt, a procession of African beast and goods and Rekhmire's coronation a vizier. Sennufer was mayor of Thebes and overseer of the gardens of Amun during the reign of Amenhotep II. The antechamber of his tomb is decorated with reliefs of grape arbors. Hunting and fishing scenes adorn the chambers of this 28th dynasty estate inspector's tomb. This tomb contains well preserved reliefs of everyday country life. Ramose was governor of Thebes during Amenhotep IV's reign. Work was begun on this impressive tomb in the classical Egyptian style, but on into the tomb, changed to the Amarnan style. This was because Amenhotep IV had become Akhenaton. When Akhenaton went to Amarna, Ramose followed, thus leaving the tomb unfinished. 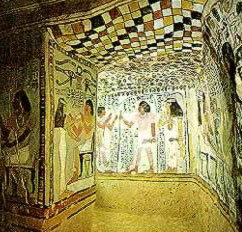 The royal scribe and tutor decorated his tomb with hunting scenes and barbers cutting hair. The royal scribe and granary inspector's tomb bears reliefs of harvests, unloading of boats, a market scene, and cattle herds. Of interest is a relief of a complete set of instruments employed in the Opening of the Mouth ritual. There are some scholars that have long believed that Yuya was Joseph of the Bible. Like Joseph, Yuya was a non-royal descendant that became the highest ranked official during the reign of Tuthmosis IV and Amenhotep III. 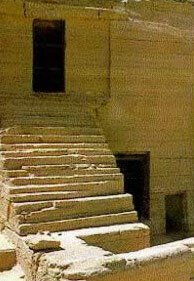 The contents of the tomb can be seen at the Egyptian Museum in Cairo.